PITTSBURGH – Country music fans will be able to tailgate in style for the Heinz Field Concert on May 18. Tailgate Guys will again offer fans a unique tailgate experience on the Great Lawn, only steps from the stadium. Jimmy Fisher, Tailgate Guys’ Vice President, East region commented on the announcement: "We are excited to partner with Heinz Field to offer Garth Brooks fans a turnkey pre-concert experience. 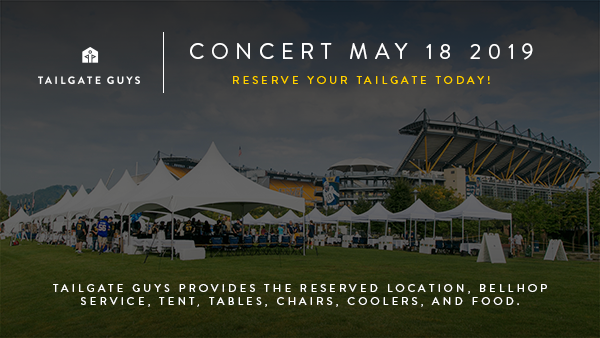 Our tailgate package options not only save concert goers time, but paired with the picturesque setting on the Great Lawn I can’t imagine a better way to begin what is sure to be a memorable evening at Heinz Field." Additional tickets for the sold-out show will also be available for fans who may have missed their chance. The concert will break the Heinz Field record for highest attendance with 72,887 tickets sold. Tailgate Guys offer two package options that both include turnkey set-up and breakdown, tents, tables, chairs, drop-off and bell-hop services and options for catering, parking, tickets, and more. Fans can reserve a tailgate experience by visiting TailgateGuys.com/home/heinzfield, by calling 412-525-4125 or by emailing pitt@tailgateguys.com. Each tailgate includes a tent equipped with coolers, tables and chairs. Concert goers can also elect to purchase additional upgrades for their tailgate experience such as on-site catering, tickets and parking passes. Tailgate Guys began hosting tailgates on the Great Lawn during the 2017 Pitt Football season and expanded in 2018 to support concert events and Steelers home games. More information can also be found at HeinzField.com/tailgate.